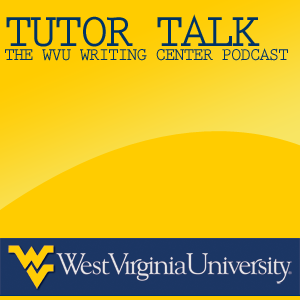 WVU Writing Center Blog: Tutor Talk Podcast Available On iTunes TODAY! Tutor Talk Podcast Available On iTunes TODAY! So after a few minor setbacks, Tutor Talk: The WVU Writing Center Podcast is finally available for download on iTunes TODAY! Click this link to redirect to your iTunes account, and subscribe to the first episode right now! Episode #1 - What's A Writing Center? In this episode, Emma answers some questions from John that most students might have before coming to the WVU Writing Center. We also introduce ourselves and talk about why we love the WVU Writing Center. As of now Tutor Talk is not indexed in iTunes search fields, so the only way to get to it and subscribe is clicking the link above. Stay tuned, because more episodes will be added very soon!